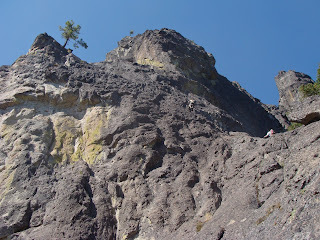 Before, I start rambling, I want to say that this is one of the funnest routes I've climbed in Oregon. Very good rock, longish (ten pitches), and little objective hazard. Its not overly difficult but it makes up for it in exposure. Now I'll start rambling. This is day two of our Southern Oregon trip. From the campground, the Peregrine Traverse was only about 20 miles as the crow flew. Figuring we were half an hour from our objective we woke up at a casual pace, had a sit down breakfast and then we started getting our day planned. We broke out the map and learned that we'd have a two hour drive! The only access road was around the mountain, along the river and through Tiller. We stopped for gas and I decided it was time to shed my pants and go to shorts. I looked over and the gas girl was watching me. I let her know I had shorts under my pants so don't be alarmed. She responded "Honey, I live in Tiller, nothing scares me." Let the adventure begin. Arriving way too late (I know, I know) we finally found ourselves at the toe of the Peregrine. The route is ten or eleven pitches w/ several variations. Depending on your comfort level you can just take quick draws and clip the available bolts but most people will want a set of cams and a set of nets w/ some extra long runners. Some people solo the whole thing. I brought four nuts and three cams. That ended up being about perfect. Amy is still getting the hang of run out trad climbing so I wanted to give her some gear to practice with. We climbed in pairs, Amy and I; Matt and John. Both very cute couples. After their cuddle fest in the tent, I noticed a closeness in them;-) Amy lead the first pitch and didn't place a single peice of gear by the time she found the anchors. She's been hanging out w/ me too long. The above pic is the top of the second pitch. Amy set out to lead the 3rd pitch as she lead the odd numbered pitches. Matt joined me at the belay as he was leading even numbered pitches. When he arrived at the belay, he looked a bit shook up. It had been awhile since he's climbed and the exposure caugh him off guard. I just tried to give him room to puke. In this pick, you can see Amy belaying me as I traverse under the roof. The area below me is called the Sunbowl and I saw several sport routes. If you enlarge the pic, you can see the anchors below and to the left of me. At this point in the summer, I had done lots of climbing and I was immune to the exposure. It was a real treat to watch the other three get comfortable w/ it! I heard John say, "It doesn't have to be hard to be scary." How right he was. As John lead pitch three I called down to him to control his breathing, he was breathing like a Rhino. He shouted back, "Thanks Jess." Which sounded alot more like "Piss off Jess, mind your business!" Eight pitches to go and I was having a blast! I lead pitch four and I managed to sneak in a variation on the team. According to the route discription, you could gain the ridge but that looked too easy. The variation shown in the pic above had a couple of bolts but there was also a key cam placement at the beginning of the pitch that would keep your second from taking a hair raising, elbow grinding swing. Knowing that I had intentionally lead us astray, I had Amy tie in at the half way point of our rope. She left the tail end of our rope at the belay for Matt to tie in. We could than top rope belay him on our rope and he could lead his and John's rope. He could have managed on his own but I saw no reason to get him blue behind the gills again. This pitch had lots of exposure to go w/ the new Crux Pitch of the route. In this self pic, you can see that John is thinking that this looks harder than it was supposed to be. Oops, my bad. I felt bad for a second but I forgave myself. They all had TR's so what's the problem? Besides, I don't believe in Kharma. Here, Matt tops out on the fourth pitch and he was no worse for the wear. The belay was a bit snug for three so I built myself a separate belay so there would be room for Amy to belay Matt up. Plus, I wanted to be out of swinging distance in the event that they didn't have the same sense of humor that I do. It's hard to tell if Matt's hitch hiking or hanging loose. Maybe both? Amy lead out on pitch 5 and there was room for Matt and John at the proper belay. If you've climbed w/ me you'll know that I like lots of slack in the belay. I hate feeling tension on my harness, it screws up my balance and my head space. It was hilarious hearing John shout up "take rope," and than watch Matt pull in 6 inches of slack. John too arrived no worse for the wear and everybody was feeling giddy about the route quality and the accomplishment of climbing the variation. 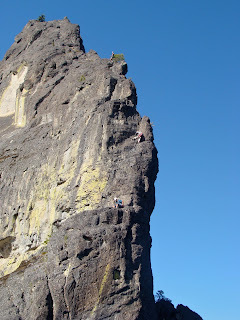 (BTW, I think climbing w/ a tight top rope is a bad idea, it gives you mental comfort you don't get when you're on lead. It makes lead climbing that much harder) There's certainly a time and a place however. From my makeshift belay, I took this pic of Amy belaying Matt up the variation. Do you remember what I said about Kharma? While taking this pic, I leaned against a non-locker that was holding my rock shoes to my harness, my right rock shoe fell. It was slow motion. I had betrayed one of the cardinal rules of climbing, don't drop stuff. If it would have been a carabiner that would have been one thing but my shoe! I tested climbing barefoot but the rock was too gritty and I'd have been bleeding in one pitch. Fortunately, we carried approach shoes for the hike down. This magnificent picture shows the belay before the 5th pitch. On the left edge of the rock, you can see Matt lounging his brains out. We've all heard North Face's moto "never stop exploring." Matt's new motto, "never stop relaxing." John and Amy both lead pitch 5, it was likely the only dangerous pitch on the route. A fall after the traverse Matt is working in the picture above would be catastrophic. There's no gear placements but the climbing is low 5th class. This section was about as difficult as Mt Washington. From Matt to the anchor where this pic was taken, you get one decent cam placement. Both of them handled the lead well and it was a non issue, except for the pucker factor. In this pic you can see me putting on my lone rock shoe. Both teams carried one small pack that the second would carry, this left the leader packless. This is a strategy I'm going to try to adopt on big one day routes. Hopefully the one shoe strategy died at the conclusion of this route. I had the good fortune of losing my right rock shoe. The left footholds in this dihedral were small. My right approach shoe frictioned/smeared fine, just a little disconcerting. Fortunately, I practice climbing in sneakers often. If I have a top rope on 5.7 and under, I generally use my approach shoes for practice. 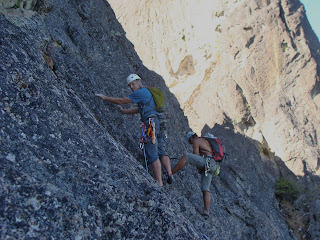 Many N Cascade routes have one short pitch of mid fifth rock that you can struggle through in approach shoes. Then you don't have to carry boots, and rock shoes. 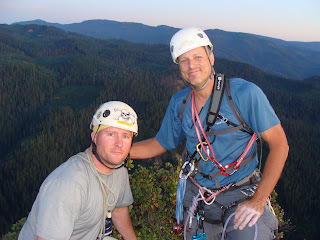 Matt took this pic while lounging at the tree belay. 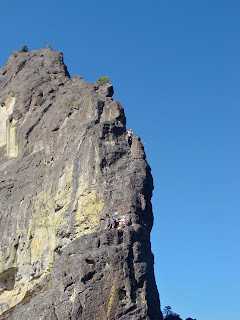 You can see me leading pitch 6 while Big John and Amy are at the belay. If Matt would have paid more attention to me and less time lounging, he might have saved himself some trouble. More on that in a bit. I've got to hand it to John and Matt. Matt has been on the sidelines. John can climb rock pretty well but he's also been sidelined by a funky elbow. Both managed their leads very well. In this pick you can see Amy climb up the beautiful arrette, me belaying and John prepping to belay Matt over (it almost looks like John is getting ready to go number 2?). It was intimidating from far but it was easier up close. Isn't that always the case? 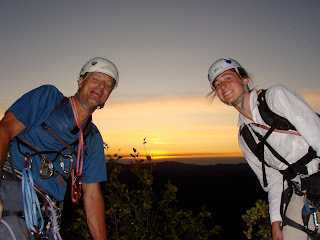 While Matt and I thought we were on belay, John and Amy were in the middle of a photo shoot. Atleast Amy's rope management was very good for a crowded belay. On belay guys? Hey guys, on Belay? "Hold on, we're trying to figure out the timer on the camera." I have to admit, this is an awesome shot. So how did it get dark you ask? Matt had a variation of his own up his sleeve. John called it the mossy variation. I basically followed the ridge up to the belay. Matt got bored w/ the easy climbing (or he got lost) and decided to head out onto the mossy face. He got some gear behind some moss and continued up the face. 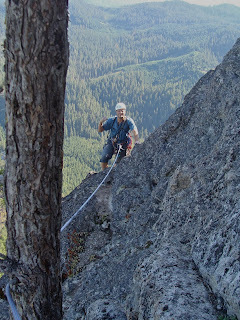 Gaining the ridge, he had passed the belay. When John got to the belay, he looked like he almost became a ghost. They kissed and made up. I love this picture. We were having an incredible time. 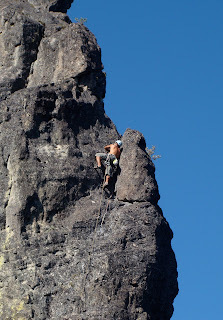 Though we were at the summit, there were still several traversing pitches and a rappel to get back to terra firma. 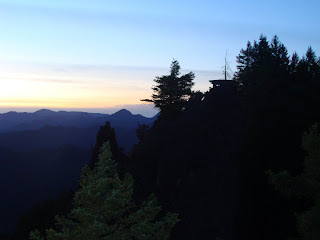 From the summit, you can see the lookout. It made you feel like you're home free. I've been on too many climbs where you're racing the sunset and you almost win. I could hear the other three joking while I was trying to coax them into continuing on. I get bossy. In retrospect, I was just uptight cause I wanted to go find my shoe! As it turned out, I scoured the burnt up forest but was unable to track it down by head lamp. I'll get it in the spring. There were two pitches of down climbing/ traversing. You leave the rocky ridge but end up descending back onto treed ledges. I began climbing the final pitch w/out a head lamp and I couldn't see a thing. Its good practice, assuming you don't fall and smash yourself up. The last pitch is a chimney and I was trying to face climb it. As soon as the groove opened up enough to stuff myself inside, the climbing was easy. I looked down and John looks up to me and says "Chimney Climbing for Idiots." Exactly! This is the view up the chimney. Along the route, I had left a few peices of gear in for Matt and John w/ super long slings that would allow them to clip the protection before crux moves. Several spots you have to do the move before you get the security of placing gear. They didn't ask this or need this but it felt like the thing to do since they hadn't been doing much lead climbing as of late. On the last pitch, all I had left was my yellow cam. I didn't want to wait for them so I headed up w/out reloading my rack. I was able to find a place to fiddle in the lone cam 2/3rds of the way up the chimney. Along the summit ridge there were fins that acted as pro. I got to the final anchors and put Amy on belay. I was a bit anxious because to get down from the final anchor, you had to rappel to a magical tree ledge that allowed you to walk off. By this time it was pitch black. 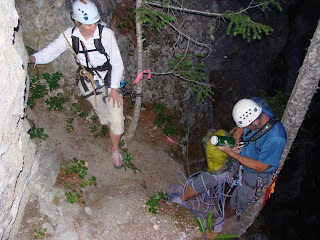 Half way down the rappel, I found the ledge and Amy soon joined me. I scouted the rest of the way while we waited for Matt and John. It looked like John was on rappel and I expected them any minute. The rappel was real awkward, the anchors were a few feet below the top of the ledge. I heard some heated discussion, not arguing but just loud talking. Then I heard a bunch of laughing, then more loud talking. They eventually laughed their way down, just a lovers spat. We'll never know what they were doing and they're sticking to the don't ask, don't tell thing. John also believes that you're never too old to be an idiot. Not even at 48! I always feel like the route I just finished is my favorite trip. As I type this, looking out the window at the rain, it's easy to remember this beautiful summer day as the best of the year. Maybe it's because, a day with Amy and two of my good friends is all it takes to make me happy, maybe cause it was good to get out w/ Matt. Maybe it's because we expected little adventure from a sport/mixed route and got alot. Sometimes things happen in life and you wonder why me? This is the opposite of those days. Two days later, we headed out on our well documented Enchantment trip w/ the Wild One.